My little angel man, you're now 22 months old. Just two months left until you turn two, that makes me so sad! It only seems like yesterday you were my little baby who depended on me for everything and now you're a walking, talking, exploring, learning and clever little toddler! This morning when you woke up you just seemed a lot older than yesterday, I don't know what is it but you had the presence of a child older than you are and you're getting taller by the day. You're such a sweetheart and you're always keen to dish out the 'love' - your word for a kiss. I even said to you during the week "give mammy a kiss if you want a little brother or sister" and you ran straight over to me arms outstretched and lips pursed to give me a kiss, I think you're sick of being an only child and want a little playmate, that'll all have to wait for another while though I'm afraid! In this month of you're life you're going to begin playgroup - another adventure for you to take part in. I know you're just going to love it there with all the other boys and girls your own age and I'll the activities you're going to do, I can't say I'm not going to miss you from home for those two hours you're away two days a week because you're my best buddy who's always following me around the house. You're still loving the characters from In the Night Garden and you call everyone 'Daisy'. The way you say it is so adorable in your high pitched little voice. You've been so happy recently and it's been great to see you like this. You're always giggling away at the silliest of things and you've even thrown up a few times from laughing so much! This month you haven't been so great with your eating, you won't finish any meal and you're always looking for something out of your advent calendar, I don't think you realise it's a 'one a day' thing yet. You're really enjoying your book advent calendar too and Daddy and I have been doing lots of reading with you. You've also been trying to give up your daytime nap too which means you fall asleep instantly once it's bedtime. I feel like this month we haven't done much fun stuff as Daddy and I have been so busy but I promise Christmas time will be all about you and doing fun things together - like playing with all your new toys! Weight - No idea but you feel a lot lighter these days. Height - No idea either but you're getting so tall now! Hair - Getting darker blonde at the roots but still light at the ends and it's SO long now, I think we may need to cut the front curls as they're going into your eyes! Clothes Size - 18-24 months. Sleeping Time - One nap a day, usually two hours long. 11 hours a night. Words - Mumma, Dada, Grandad, Nana, dog, cat, shoe shoes, door, slide, mess, uh-oh, tired, one, two, three, walk, yeah, no, hey, this, kiss, car, who is it, who is he, love you, lovely, out, hungry, hi, hiya, hey, go, again, nice, love, Daisy, Iggles, Christmas, Santa. Loves - All your cuddly toys, playing with water, being outside, In the Night Garden, going for a walk, toy cars and the wooden fire engine, running around the place, climbing the stairs and coming down it, being thrown up in the air and doing gymnastics, pretending to be dropped, older children, lying on all your cuddly toys, the sea, lemon and lime water, the playground, going to Nan and Granda's house, chocolate, books, and pushing your shopping trolley. Hates - Having your face cleaned, getting your nappy changed, sitting still, being told 'no' or 'ah ah ah', being made to eat your meals, when you don't like what's on tv (you make me change the channel every two seconds!) - especially the music channels, when it's time to leave other children and when our walks are over. I love you little angel man, everyday with you is such a blessing. I love his hair!He is so pretty boy! He's so adorable! Love his hair. He is so cute. 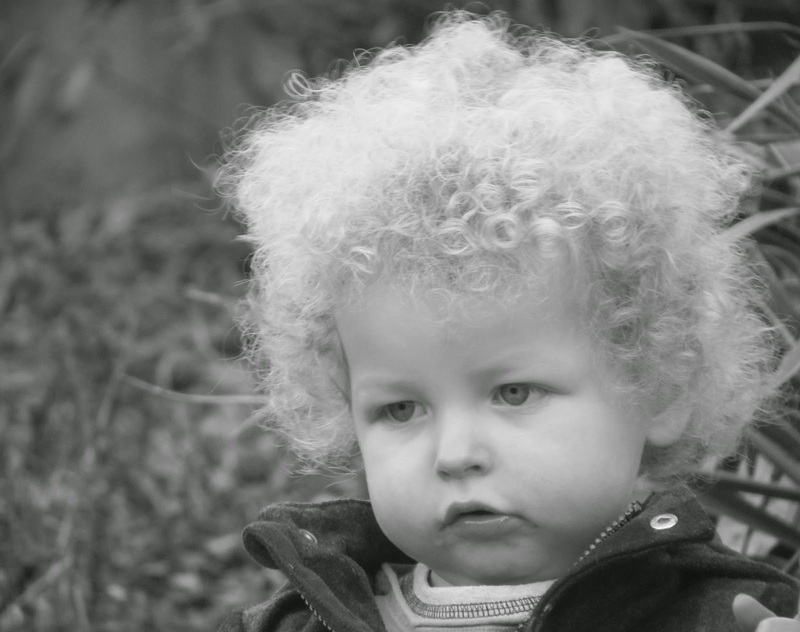 I love the head full of curls and those cheeks. They grow up way to fast. This is such a heart touching post! He is gorgeous! So cute! I just love his curly hair. He's just gorgeous!! Love his hair! I'm glad my boys aren't the only ones who are impatient with the tv! Carmen Perez: Wow, look at that face and those curls! Just gorgeous! I love his hair! He has so much personality, you can see it all over his face. It sounds like he's developing quite a little personality and what a delightful one it is. He is really a cutie pie! He's so cute! I love his hair! They grow up so fast! You got a lot of cute pictures, I love his hair!! Oh wow, what an adorable lil' angel you have there. His eyes and hair just go together. I bet they used his picture for the cherubs because put some wings and that baby and he would be the perfect model. Too beautiful. 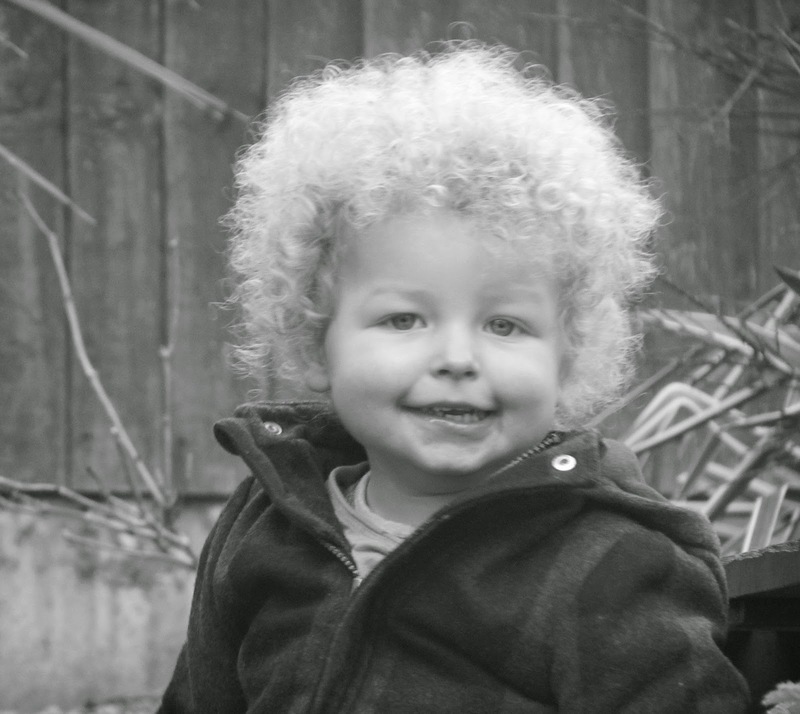 Aww, I love all of his curls! He is absolutely precious. My youngest just turned a year old earlier this month. He is such a cute little guy. Two already wow the time has flown by. Before you know it he will be turning 16. If that was my little one, I would dread his hair to match mine ;) He is absolutely stunning! I just love his HAIR! That is so amazing.